PennDOT District 11 is reminding motorists about the benefits and rules of using the High Occupancy Vehicle (HOVs) lanes on the Parkway North (I-279) and I-579 (Veterans Bridge) in Allegheny County. 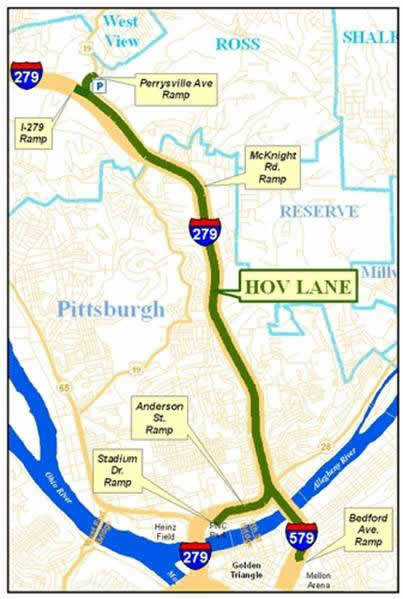 The HOV lanes, located in the median of the I-279 and I-579, are open to commuters in vehicles with two or more passengers Monday through Friday between 6-9 a.m. and 3-7 p.m. HOV lanes promote carpools and vanpools, which help to conserve fuel, time, and reduce congestion on other roadways. Motorcycles are also allowed to use the HOV lanes and are not subject to the two passenger vehicle rule. Motorists may also be surprised to learn the HOV lanes are open to all outbound traffic on weekends after 7 p.m. on Friday and remain open until 5 a.m. on Mondays. In addition, the two passenger vehicle rule does not apply during weekend hours. To alleviate congestion, motorists are encouraged to use the HOV lanes to exit the downtown area following Pirates, Steelers, Penguins, and Panther games and other events on weekends. The 5.3 mile reversible direction HOVs opened in 1989. The Pittsburgh region has the only HOV lane in the Commonwealth of Pennsylvania. Motorists are advised to use caution and expect changing traffic patterns when traveling through the area. Log on to 511pa.com or call 511 from any phone to check traffic conditions on major roadways before traveling. Given the number of people moving to the north hills recently, I'm still stunned that usage is declining on this HOV lane. Perhaps it should be converted to a left-lane HOV in both directions like in DC, LA, and Toronto and other cities.